In the world of boxing, the word “bum” has long had an unfortunate connotation, usually employed to deride a pugilist’s in-ring skill or commitment to the fight game, much like Mickey Goldmill deemed Rocky Balboa a bum. In “The Harder They Fall”, however, the term “bum” acquires even more sinister meaning. Indeed, in the case of Argentine boxer Toro Moreno (Mike Lane) the term bum is more evocative of the boxer’s role less as any kind of actual boxer than a performer, one whose entire career is a fabrication invented by fight promoter Nick Benko (Rod Steiger) and sportswriter Eddie Willis (Humphrey Bogart), taking the desultory job merely because his newspaper has gone under and he needs money. They deem Moreno The Wild Man of the Andes, invent victories he never attained that no eyewitnesses can vouch for, and schedule him fights that are all fixed, determined to keep the ruse going until Toro is fighting for the heavyweight championship, making them all rich along the way. The slugger’s professional helplessness is best evinced in a shot where Toro is seated, just his head visible in the bottom corner of the left hand side of the frame, as Eddie and Nick and their various hangers-on argue and discuss Toro's future, what they want him to do and how they will go about having him do it. Toro has nothing to say; he is at their mercy; he is a bum. The finer points of boxing are never discussed, and the violence in the ring is presented as being completely phony, totally real, and all part of the show. Huge and lumbering, Toro’s fights are laughable affairs where he doesn’t do much more than bop opponents on top of the head. Yet when a man who has already been knocked senseless by the heavyweight champ meets Toro in the ring, a few meaningless taps to the head trigger the man’s skull inadvertently trigger his ultimate demise. Still, Toro is given “credit” for the death in the press, which upsets the heavyweight champ, who seeks Eddie out to explain that he, not Toro, should be called the killer. It is evocative of Ron Howard’s “Cinderella Man” using the death Max Baer caused in the ring in real life, and in real life felt guilty about, simply as a means to paint the pugilist as some sort of man-killing monster. But if Howard used it un-ironically, in “Cinderella Man” director Mark Robson was cosmically calling Howard on the carpet 49 years in advance. Lane’s performance as Toro is serviceable in just the right ways, out of his element and in over his head without ever realizing it, as if he’s a professional wrestler who even in the ring fails to grasp that the whole thing is fake. That’s why when Toro realizes everything is rigged and enters the ring in the climactic bout against the heavyweight champ, the moment is absent any kind of heroism because you know he’s getting his clock cleaned. It’s not Ali leaning on the ropes against Foreman; it’s Ali taking a battering against Holmes for no other reason than misplaced pride. It hurts. It hurts Eddie too, who only takes this desultory job because his newspaper has gone under and he needs a little financial security. That fatalistic air was nothing new to Bogey and he gives that unrivaled weary cynicism another exemplary workout here. 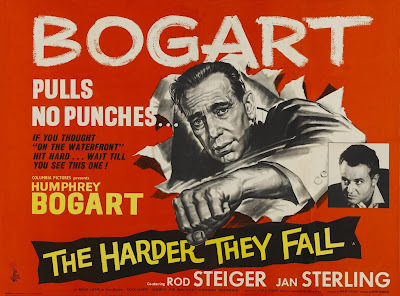 In his introductory scene, where the plan is pitched to his character, Bogey does that thing he often did, that sort of faux-pacing, a couple steps this way, a couple steps that way, all while rubbing his ear and getting the look of a man who has encountered a flooded road and is deciding whether or not to try and drive through it even though he already knows he will. And sure enough, when the car winds up stuck in the water, he doesn’t panic nor bemoan his misfortune but examine his options for cutting his losses. As such, even when Eddie knows Toro is doomed, he cannot help but council the boxer to get in there anyway, as if getting paid will remedy everything. Yet when he learns Toro is not getting paid, at least not as much as he should, Eddie boils over in an exquisitely framed scene where Nick and his yes-men wine and dine, indifferent to the raging humanity of Eddie behind them. In his own way, the character becomes a kind of pugilist, forced into the corner, fighting for his life. Even as he is, however, one punch remains. He might be a writer, but all throughout “The Harder They Fall” we never see him write, not until the end. Forced into the corner, he rears back and with a typewriter and a front page, evoking his “Deadline — USA” (1952), pulls himself off the metaphorical ropes and throws one last knockout.